Home » about us » What is SaGGAs? Sagada Genuine Guides Association Inc.
Is a group of tourist guides that seeks to provide guests the worth of what they are paying. 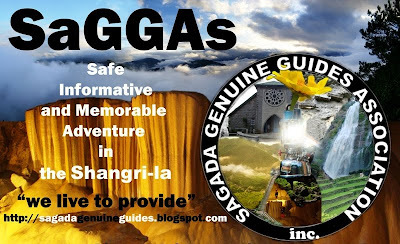 This is a site designed to assist tourists regarding their tours and queries about Sagada. We are not a Travel Agency. We help tourists tour Sagada successfully with information and basic knowledge about their travel and experiences. What makes SaGGAs unique from any other Sagada websites? The BlogSpot is constantly updated and maintained by a native and resident of Sagada. A tourist guide who practices and disseminates first hand information to the readers. Genuine means “true” or “what is meant to be” guides who execute rapport based guiding techniques and travel in a patience oriented pace. Guides are fond of basic digital photography, encouraging and initiating guests to take the opportunity creating memories than just worrying about their paths. They are not just Informative and helpful, they are dependable approachable and responsible for all their actions. 50% of your time in Sagada is spent being with a tourist guide, and a guide plays a major role in the level of success for your tours so CHOOSE WISELY. While most tourist destinations in the Philippines are visited without the need for tourist guides, Sagada begs to differ. How can you be sure that that everything said is true? Profiles of all the members of SaGGAs are publicly displayed on the right side of this blog, subject to criticism, comments and merits, you as clients can have a way to get even with our guides. The contact numbers are displayed for your convenience.